This vital piece of information from OLX is a must read 'cos it might serve as a good guide for you when buying your next used car. 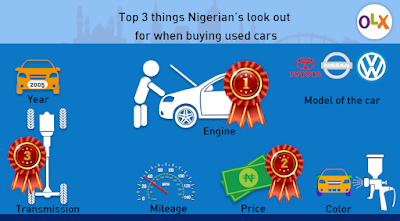 A dipstick survey carried out by Nigeria’s number one online classifieds site, OLX has uncovered what Nigerians look out for when buying used cars. According to OLX Country Manager, Lola Masha, the research was carried out to identify what is most important to our users when buying used cars. “This information will enable us educate them on what to really look out for when in the market to buy a used vehicle”. 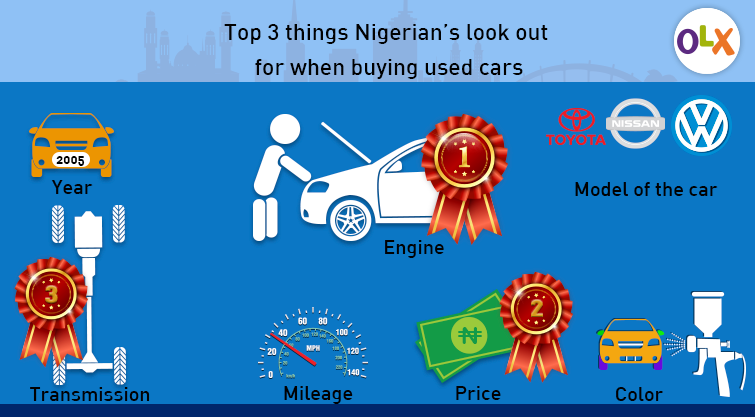 The result of the research carried out by OLX Nigeria identified the engine, price and transmission of the car as the top three things they look out for when purchasing a used car. The poll revealed that 26 percent of the respondents believed that the engine was the most important thing to consider when buying a used car. This was followed very closely by 22.3 percent who considered the price as a vital thing to consider and 1.7 percent chose the transmission. While, the remaining 38.4 per cent, chose the model, colour and year of the car. Nigerians who are in the market to sell their used vehicles can post their cars on OLX for free and qualified ads will get an evaluation certificate from Mandilas that will state the current market value of the car as well as the condition of each part of the car. This will benefit both the buyer who is worried about the worth and condition of the car they want to buy and the seller who is not sure of the monetary value of the car. OLX is the world’s leading classifieds platform in growth markets and is available in more than 40 countries and over 50 languages. OLX connects local people to buy, sell or exchange used goods and services by making it fast and easy for anyone to post an ad through the mobile app. Every month, hundreds of millions of people in local markets around the world use OLX’s online marketplace to find and sell a wide range of products, including vehicles, electronics, phones and much more.